You are here: Home / Blog / What are the Plastic Cable Ties Sizes in MM? What are the Plastic Cable Ties Sizes in MM? Hi, friend. I believe you must know of plastic zip tie. And you must be very familiar with it. Now I have one question to test. 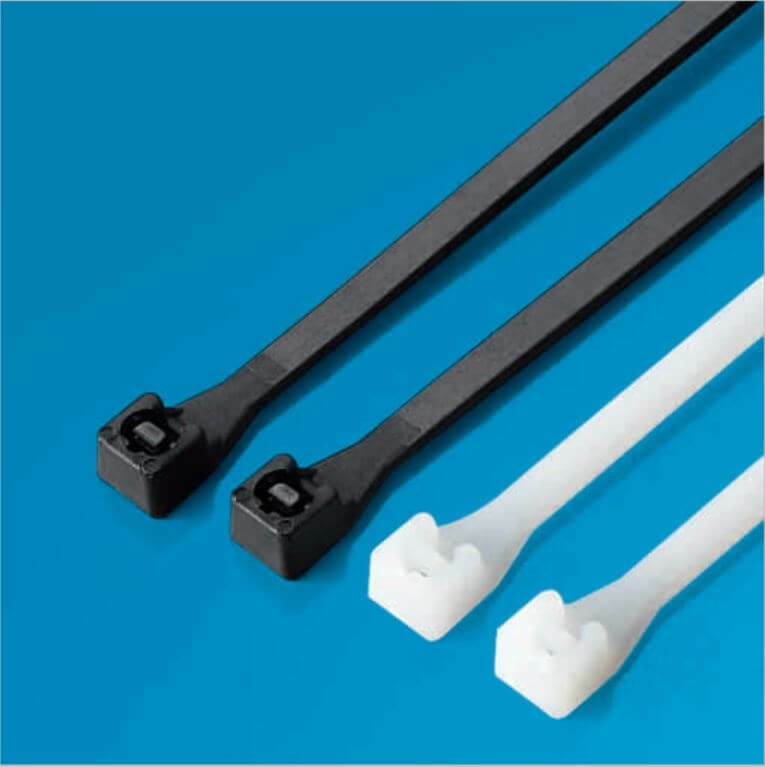 Do you know the detailed sizes of these nylon cable ties? Someone may say yes. There are 2.5 mm x 100 mm, 3.6 x 200 mm and so on. Right, these are parts of the whole sizes. So you do really have some knowledge about the zip ties. If you do not know any of the sizes, you may have some troubles. For example, how can you buy the right and suitable size? This is a very big problem. As we all know, this little plastic thing has stepped into our daily life and society. If you are not going to use it for the factories, you must use it in the household. Without this tie, it will bring many troubles to us. So don’t worry, friend. It doesn’t matter. It is because today I will make a full introduction of the specifications. When we talk about the size of the ties, actually, it means the width and the length of them. People usually use the width and length to say about the little ones. There are widths of 2.5 mm, 3.6 mm, 4.8 mm, 7.2 mm, 9.0 mm, and 12.0 mm. And according to the different heavy duty they can hold, these sizes can be divided as below. Now let go nearer to these zip ties. I will expose them to you in details with small charts. 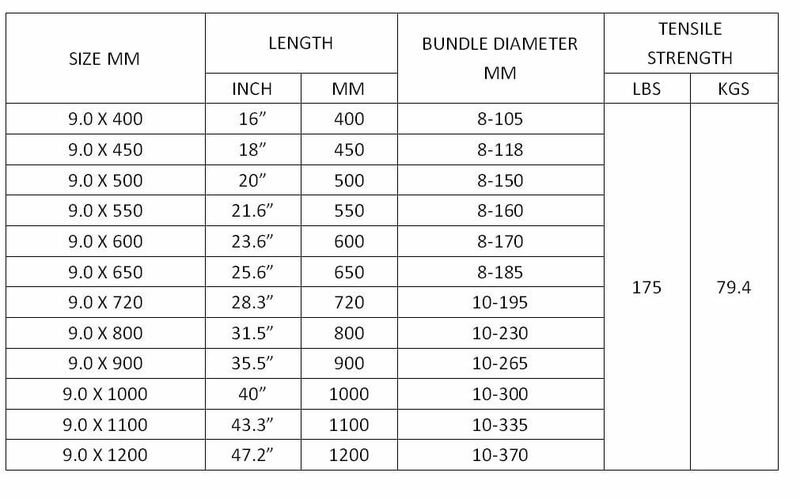 Though this chart, it is easy to find these width of 2.5 mm cable ties can not stand too heavy duty. So they are called the miniature. And there are inch expression of the lengths for the users who prefer the inch to the mm. Can you find the bundle diameter of 2.5 Series? The range of the diameter is from 2 mm to 50 mm in the 2.5 Series. If the article is bigger than this diameter, you need to consider to choose a bigger width. These kind of 2.5 mm wide ties can be used to bundle the small wires and cables. They are very popular in the household. The housewives enjoy using them in the kitchen to hang their spoons, foxes and spatulas. And some of these small ties are used to bundle the computer data wires. These are wider than the 2.5 mm. So these ties’ tensile strength have got stronger. They are 40 lbs. Or we can say the tensile strength is 18 kgs. The bundling diameter for the articles also goes longer. The longest range goes to be 105 mm. That means when we use 3.6 mm wide cable ties, we can bind bigger things than using the 2.5 mm wide ties. If you have bought these 3.6 mm wide zip ties at home, you can use them to hang the curtains in the bathing room. They are very strong and simple to use. 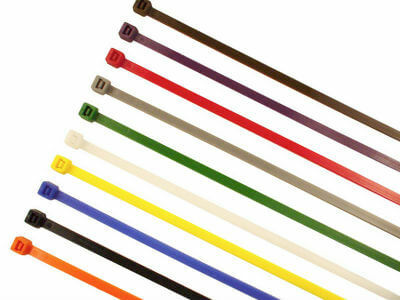 These 4.8 Series cable ties are the most popular ties among so many sizes. Most users will prefer to use them, instead of using the smalls size or the big sizes. 4.8 mm wide is called the standard. And among the 4.8 Series, the size 4.8 x 300 mm is the most well sold cable tie. 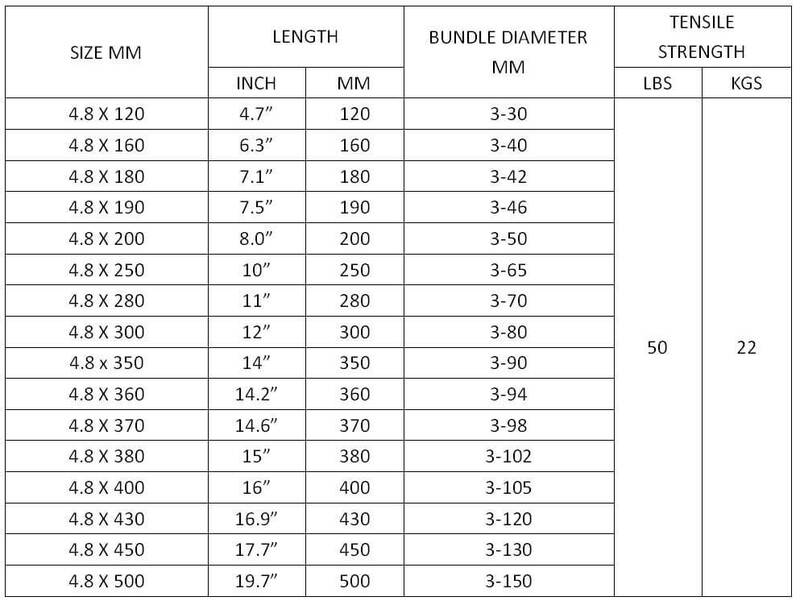 The length of 300 mm is appropriate for bundling most of the things in our life. It won’t be too long or too short. And the tensile strength of this type is also strong enough for holding many kinds of forces within 22 kgs. If you are interested in size 4.8 x 300 mm, you can buy some for a try. It can satisfy nearly all the demands of the bundling and fastening in our household. After introducing 4.8 width ties, there must be bigger sizes to meet higher force requirements. The width of 7.6 mm zip tie owns the tensile strength of 55 kgs. This high tensile force means that one piece of 7.6 wide nylon cable tie can stand the weight an female adult. Is this amazing? Just one piece of plastic tie can stand the adult’s weight! Do you want to have a try? I am very willing to make such a test. I am a bit slim. I just weight 45 kgs. Does anyone be willing to test the tensile strength of the 7.6 Series light heavy duty zip tie with me together? These series of product have high tensile strength. It can reach to 79.4 kgs. So these ties are not suitable in our household. And the length of them are 400 mm, 450 mm, 500 mm, 550 mm, 600 mm, 650 mm, 720 mm, 800 mm, 900 mm, 1000 mm, 1100 mm and 1200 mm. These are very long sizes. So usually, there is no one to tie a computer line with the 9.0 mm wide zip ties. They are too big in the size. And one more problem is that the cost of the 9.0 mm heavy duty tie is not cheap. In general, they are used for the oil pipes, the shipping manufacturing fields, the mechanical machines and so on. These places needs the big size and big bundling diameter tie to secure the articles. These ties are called extra heavy duty ties. They are owning 114 kgs tensile strength. So they can hold very heavy duty. The bundling diameter is from 14 to 265 mm. And the lengths of the 12.0 wide cable ties are 650 mm and 900 mm. They are also used for the places where the tensile strength needs to be very high. 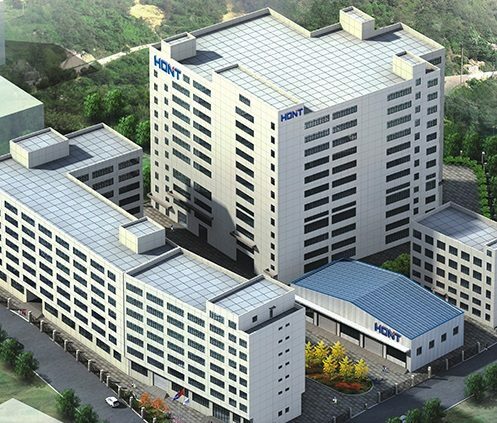 How to Choose the Suitable Specifications? There are so many sizes above. So how do you feel after knowing these sizes? My feeling is too many sizes. You must have the same feeling with me. How do I choose the right size when I am in the shopping? Now I have some tips for your shopping. If you have followed all these tips, there must be no problems to choose the zip ties. 1. According to the using purpose to buy the ties. Different cable ties have different materials. They are applied for the various usages. So before the purchasing, we are clear that where we are going to use the ties. 2.According to the requirements of the tensile strength. The key point for one tie is the tensile strength. If a tie can bundle the goods well, its tensile strength must be very good. However, many people have the misunderstanding on the tensile strength. It is not suggested us buy the ties with higher tensile force. The saying of the higher the tensile force the better is not right. If the tensile strength is too big, the article is not easy to be bundled tightly. If the tensile force is too small for a big article, the zip tie is easy to break. 3.According to the using quantity to buy the ties. We need to avoid to buy too many zip ties. These ties can not be used in recent period. They will be easy to get aging in the storing time. So it is better to buy according to how many we use. 4.According to the appearance of the nylon cable ties. The two factors of the appearance are the color and the workmanship. No matter if the color is white or red, yellow or blue, the appearance must be smooth. There must be no unpleasant odor. The workmanship should be fine. 5. According to the length of the tie. Above I have introduced the lengths of the zip ties. 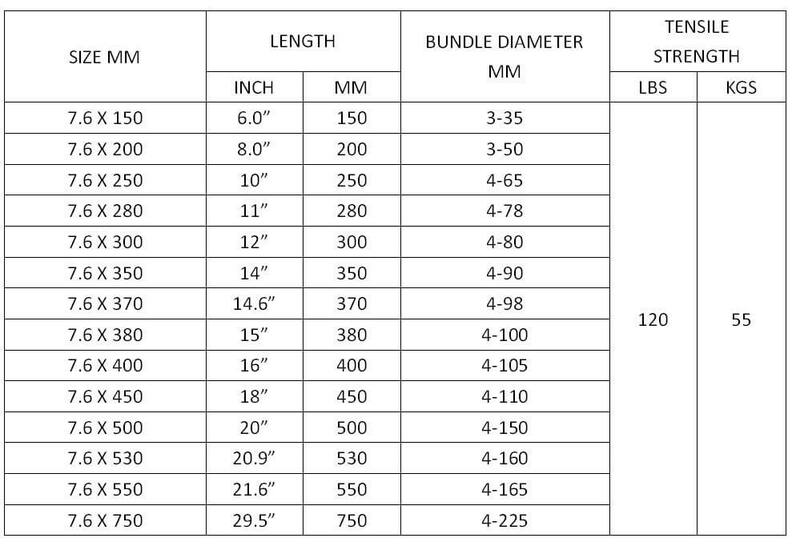 And the charts have listed the bundling diameter range of each size. In the bundling, each piece of the tie needs to spare no less than 10 cm of tails. So we are better to choose the tie with a long tail. The tie with too short tail will be difficult to have a tight fastening. If you follow these tips, there must be no problems in the shopping. Just as the introduction above, the tensile strength of one cable tie is very important. It will decide whether this zip tie can hold the fastening task directly. Our new star, patented cable tie, can easily beyond all the ties on the market in the aspect of the tensile force. It was designed by the company’s researching and developing department. It has ascended as the top among so many cable ties on the market. Here are the advantages the PAT cable ties equipped. It uses 2% more PA 66 than common ties on the market. It has 30% tensile strength higher than the standard cable ties. It is thicker in the body in the appearance. And that is the reason why it has far higher tensile strength than the common. It has a bigger head and thinner width, as the improvements of the appearance. It owns more exquisite workmanship on the market. It is as cheap as the standard common zip ties on the market. So are you moved by such a perfect nylon cable ties? Just act! It won’t make you down. https://hont-electric.com/wp-content/uploads/2018/12/2018-11-17-17-03-367.jpg 300 400 admin https://hont-electric.com/wp-content/uploads/2018/12/logo.jpg admin2019-04-06 17:04:562019-04-24 07:21:17What are the Plastic Cable Ties Sizes in MM? 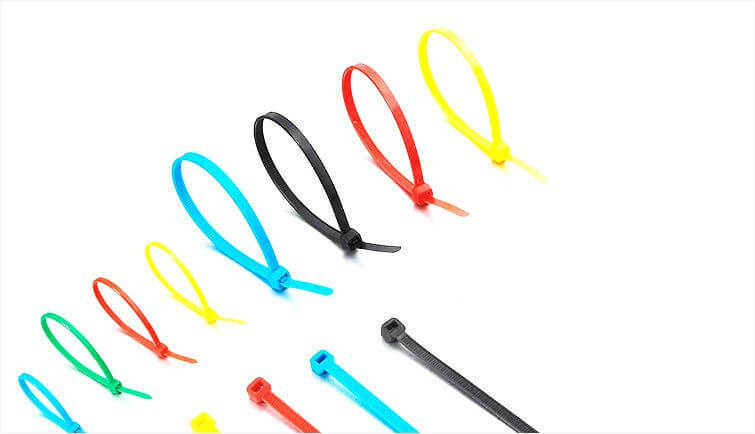 Nylon Cable Tie Uses: Can You Blow Your Mind for 12 Ways? 7 Reasons Why You and I Need A Reliable Cable Tie Manufacturer?